“Miss O’Brien looked at me-I didn’t see her looking at me but I knew she was. She wanted to know who I was. Who was Steve Harmon? I wanted to open my shirt and tell her to look into my heart to see who I really was, who the real Steve Harmon was. Hi from library school in Montreal, friends! Look what I have for you: a fast read, an incredible story, written by an author you should definitely get to know, if you don’t already. You are going to go crazy about this one! Steve Harmon got mixed up in some bad business. Felony business. He’s a 16-year-old who grew up in Harlem, and he agreed to be the lookout for a friend who was planning to rob a drugstore. The robbery went south, the owner was shot and killed, and Steve finds himself looking at 25 years to life in prison if he is convicted. The story follows his trial, from his own perspective. He talks about prison, and his deepest fear: everyone looks at his brown face and hears about the crime, and thinks he is a monster. Deep inside, he’s afraid that everyone might be right. See all those shiny medals on the cover? 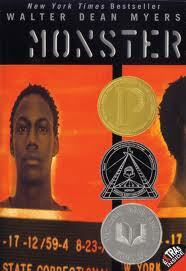 Those are the biggies: Printz, National Book Award Finalist, and Coretta Scott King award. Plus, Walter Dean Myers has been awarded the Margaret Edwards Award, the one given to honor lifetime achievement. That’s only handed out to one author, once a year. Big stuff, guys! Of course, there are amazing books and authors that go unrewarded out there, too, but the awards are a great guide if you’re not sure what you want to read. So, awards aside, the beauty of this book is its gritty story, simpler language, and unconventional format (a pastiche of journal entries and film script). The format makes it especially appealing to ELLs, or older students who may need a really good hook and a fast-paced read, as well as anyone not looking for a straight-up, novel-style read. ( However, while it may be a quick read, Myers definitely does not sacrifice emotional impact or plot.) I finished it over the course of a week, but that was because I was interrupted by an international move, and after the furniture-assembling, apartment-cleaning, grocery-st0re-finding-missions, and hours-long Skype phone calls, all I could do was read for a few minutes and fall asleep with my cheek smashed into the pages. Thanks for being patient-I really did want to get this finished and share it with you! Myers, Walter Dean. Monster. New York: HarperCollins, 1999. 281 pp (but it reads quickly!). Ages 13 and up.